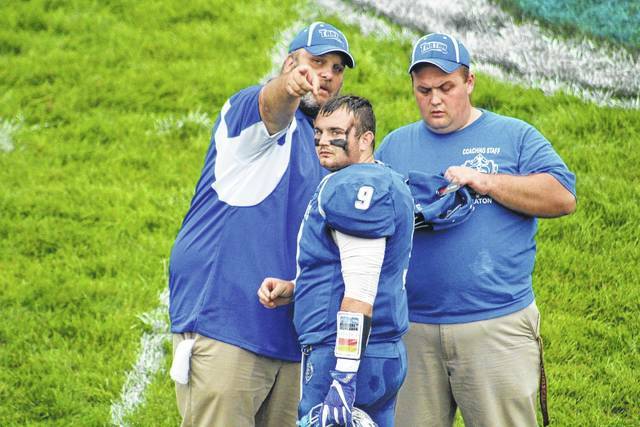 East head coach James Gifford talks with quarterback Brady Douthat before the game. If one thing is for sure, Sciotoville loves their East Tartans. Following their traditional pregame parade through town, East gave the fans something to cheer about at the Tartan Turf on Friday night. In a dominant all-around performance, the Tartans sealed a 46-0 win over the Green Bobcats in their home opener. East allowed just 25 total yards of offense, and didn’t let Green complete a pass. The Tartans didn’t wait long to make some noise, either. After receiving the opening kickoff to start things off, East scored on their first play from scrimmage when Ethan Carver dashed 58 yards down the right sideline to bring the fans to their feet. East missed the extra point, but still had a 6-0 lead. 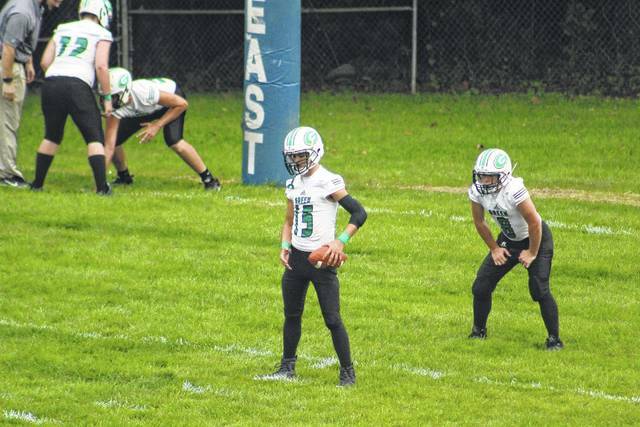 The first drive for Green was perhaps their best of the day, as the Bobcats were able to move the ball into Tartan territory before being stalled out. East had to earn their next scoring drive. The Tartans fumbled in Green territory, but quarterback Brady Douthat was able to dive for the loose ball and keep it in his team’s hands. A penalty the next play against Green moved East into the red zone, and from there Douthat found Braiden Haney from 17 yards out. Once again, the Tartans missed the extra point, giving them a 12-0 advantage. Green wasn’t able to move the ball offensively once more, which became a recurring theme of the game. The Bobcats lined up to punt to East’s Kyle Flannery, who nearly took it to the house on the return. The run put East at the Green 10 yard line, and Flannery capped off the drive on the second play with a 10 yard rush. Haney finally knocked home an extra point to give East a 19-0 lead, still in the first quarter. Scoring didn’t stop there, though. East got an interception which gave them great field position. Ethan Gifford answered the turnover with a big run on a direct snap, marching all the way to the two yard line. Ethan punched it in the next play, and the Tartans added two points on a pass from Douthat to Chase Coyle to stretch the margin to 27-0 with 27 seconds left in the first. East was aided all day by great field position. Haney blocked two punts to give the Tartans a prime spot on the field, and Green had several turnovers to top things off. After one of Haney’s blocked punts in the second quarter, Douthat scored from 17 yards out on a run. When the play was called back for holding, Douthat then ran it to the opposite side on the next play and scored for 27 yards out instead. The two point try was no good, so East now was on top 33-0. Another Haney blocked punt the next drive set up the Tartans for success once more. Douthat hit Flannery on a short out route, and Flannery did the rest of the work making defenders miss on his way to a 36 yard score. With a missed extra point, East was up 39-0 with 8:10 left before halftime. Devon Stevens added the Tartans’ last score of the game from 16 yards out, and a missed extra point made things 46-0 in favor of East with 3:37 remaining in the first half. The defensive play for East was impressive without a doubt, but Green was decimated entering the game by injury. The Bobcats were without three of their starting offensive linemen, and three of their starting running backs. Those players were certainly missed for Green, and the stats show it. With everyone healthy in the opening week, the Bobcats posted 358 rushing yards. On Friday against East, Green managed just 25 yards rushing. Although his team came up on the short end of the scoreboard, Newsome left the game very happy with the way his kids played. On the other sideline, Gifford enjoyed the win but was looking ahead for areas his team could improve in down the road. Those simple things can add up, according to Gifford. Even the smallest of details could have a big impact on the outcome for his team. East (3-1) will host Manchester (1-3) next Friday. Green (1-3) will hit the road to play Symmes Valley (2-2) on the same day.